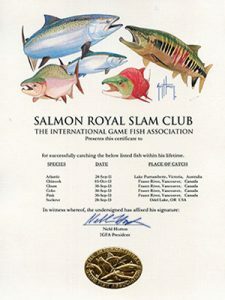 Members of the Slam & Trophy Fish Clubs receive a custom, hand-signed, embossed certificate depicting their achievement, and are permanently listed online and in the IGFA's World Record Game Fishes book. Please click on the appropriate link to receive more detailed information about a particular club as well as a printable application. 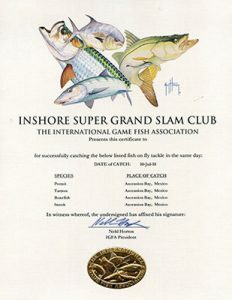 Inshore Grand Slams, Offshore Grand Slam, Trout Grand Slam, etc. Billfish Royal Slam, Salmon Royal Slam, Bass Royal Slam, etc.